These are only some of the questions addressed by Mary Ellen Copeland during last week’s engaging and informative webinar on The Concepts and Process of WRAP and Peer Support. In addition to the energetic Q&A session, Mary Ellen discussed the development of WRAP and Peer Support, shared some of her own personal experiences and provided many examples to help others move forward in their wellness journey. How is using Peer Support going to affect how you develop your own WRAP? When enhancing your WRAP through Peer Support, you will find yourself thinking more deeply about the process and that although developing your WRAP might take longer to allow for more discussion time with your peers, the end result is magical! 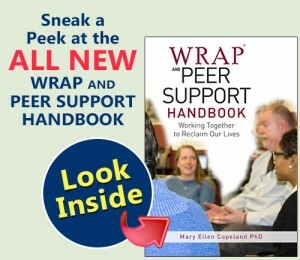 Written in an easily understood format, the WRAP and Peer Support Handbook takes you through the process of using WRAP and Peer Support together and includes many examples, role playing options, WRAP forms, discussion topics and more! If we could come together and get everyone moving forward in their lives – those in institutions, in group homes, homeless, in Veterans facilities, in prisons and jails, in their own homes, and in the community – If WRAP and Peer Support could become the way we do things, what a great place the world would be.